One of the most annoying things for any auto fanatic is to roll around underneath their vehicle on the cold floor with very little space to complete maintenance work or customizations. If you are serious DIY car mechanic, or if you want to start up your own shop, you’ll have to seriously consider the purchase of a car lift for your home garage or workshop. The price of car lifts has fallen significantly in the past few years and are now available even for residential use. 2 post car lifts are a great option as they offer an advantage over their 4 post counterparts by allowing greater access to all areas to the chassis of the vehicle. Though a 4 post lift does provide the added benefit of storage, where you can lift one car for storage and park another below, thus maximising the space available to you in your home garage. Plus, once you have a vehicle lift installed, you will find yourself tuning and tinkering with your car more often, as you now have all the room you need and easy access to your tools. 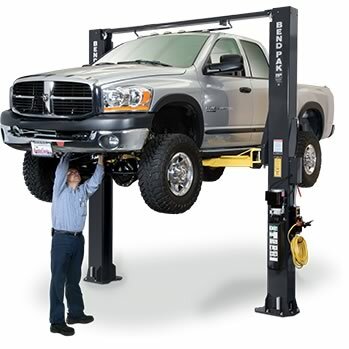 Starting at $1795 you can get a certified, safe auto lift, that can lift a 9000 lb. vehicle 70.5 inches, in less than a minute, allowing you to work on it standing almost upright. Prices go up to $3435 for top of the line models, so there is something for everyone’s budget and requirements. No more aches from your twisted neck, no more cuts on sharp chassis edges! The use of a car lift will seriously increase the joy you get from working on your vehicle and who knows, it might mean the start of a whole new career! However, with so much choice, which is the best one for you? To help, we have included the best of each type as well as different price points in our review. From 2 post lifts, to 4 post and scissor lifts, accessing their lifting capacity, features, and cost to decide which we think are the best. Are Scissor lifts ideal for your residential garage? If you are looking for a portable car lift, then the BendPak MD-6XP mid-rise scissor lift is probably the best choice you could make. Capable of lifting 6,000 lbs max, this portable car lift can handle most cars and even trucks, which is pretty impressive. If you are going to put your body under 6,000 lbs of vehicle, you are probably wondering how safe this scissor car lift is, and so you should be. Safety is the major concern for any manufacturer and BendPak are no different. They demonstrate this with the MD-6XP by building lots of safety features into this auto lift like the safety lock bar which has multiple locking positions, which keep you and your employees safe but also have the added benefit of adding versatility. Talking of being versatile, the lift also comes with a truck adapter, meaning you are good to go to work on pretty much whatever you have, straight out of the box. As well as being versatile, the BendPak MD-6XP is also practical and has an adjustable arm and a nifty means of being able to move it around your workshop with very little effort. How easy is it to setup and use the BendPak MD-6XP? Checkout this great video showing you setup and first use. Although this car lift is small and does not take up much room, there will be times when you do want it out of the way and achieving this is simple. The motor that lifts your vehicle in to the air also acts as a dolly, so moving it around your workshop is a breeze. The build of the lift is excellent and the materials used are quality, including the hydraulic hose which is of commercial grade. The MD-6XP mid-rise scissor lift is extremely easy to operate, and quick to, achieving max height in only 45 seconds. The lift height is just enough to give you great access to everything you need underneath your car, truck or SUV and allow you to perform any mechanical task required. 93% of buyers have rated this car lift as 5 star on Amazon, which shows the satisfaction of the VAST majority of users. Comments left by satisfied customers like “much more room under the car than I thought’ and “the perfect garage accessory for the auto enthusiast” give you an idea of the love that this car lift gets and how good a job it does. If you have limited space or are looking for a portable car lift, then the BendPak MD-6XP is an excellent choice and our top recommendation in this review. If you require a lift with the capability of lifting heavier vehicles, BenPak also produce 2 and 4 post lifts, which you can see our review of further down the article. Overall, a stunning, simple and practical piece of kit that any home or professional mechanic would be happy with. If you want to be able to stand beneath your car to work on every possible part, then a 4-post lift is what you should be looking at and the Triumph NSS-8 is a solid choice and deserving on a place in our top 6. After all, a scissor lift is great for portability but the 4 post lift, is he daddy of car lifts and gives you so many more options. One of the options available to NSS-8 owners, is to not only use their car lift to perform modifications and repairs but to use it to store a second car or vehicle. By lifting one vehicle up, you can park a second underneath, thus doubling your available floor space in your garage or workshop. This is actually extremely handy and with a lifting capacity of 8000 lbs. or 4 tons, you can store even larger trucks if required. Though you are much more likely to store something like a Corvette on top and your daily run around on the bottom, or if you are really lucky, your second Corvette, like this lucky guy! Versatility is the name of the game for the NSS-8, not only can you use this car lift to work on your automobiles and store another vehicle to free up space, but you can also move it around within your workshop or residential garage, thanks to the fact it comes with castors. Nifty, though personally, I would recommend you bolt it into place in a fixed location for ultimate safety, well thats how I use mine! A couple of other nice features to this Triumph 4-post lift, which are not always included with other manufacturers and models, is the included drip tray to catch any liquids which could drip from your car and jack trays which are perfect for jacking up your car when it is on the lift. Although some have complained that the car lift does not come fully assembled, I actually think that this is a good thing most of the time, as I would personally struggle getting it through my garage door if it arrived fully assembled! All of the major parts ‘are’ assembled and it takes about a day to finally put it all together, a little quicker if you have some help. What exactly do you get with the NSS-8? Take a look at this handy video to see everything that is included. 92% of customers who bought this lift on Amazon rated it as either 4 or 5 stars, which again is extremely good product customer satisfaction and one that gives you confidence that this 4 lift post car lift will not let you down. Some of the comments left in customer reviews include “exceptional product”, “excellent lift for the price” and “for the price, you can’t beat this deal”. Not bad at all! For the price, this is an absolute bargain. 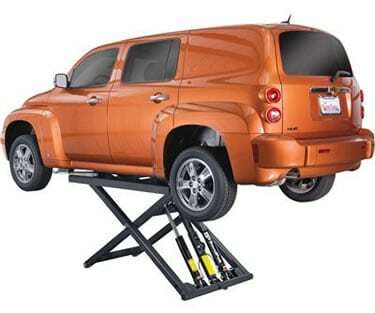 Think about it, you are getting a good 4 post car lift for roughly the same price as the portable BendPak scissor lift. So if you are looking for the ability to use your vehicle lift to store cars, or work underneath standing and have access to everything, this is a great choice and rightly the top choice 4 post lift in our review. Similar to our number 2 recommendation, the Auto Lift Car-Park-8 can be used for both storage of multiple cars and used as a traditional car lift to perform repairs and upgrades to your vehicle. 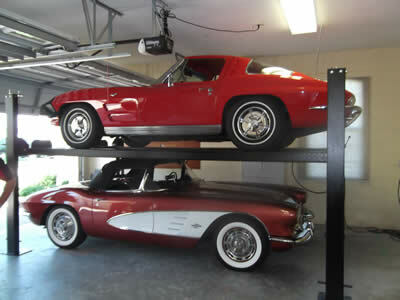 So again, a very versatile option for anyone considering a car lift for their home garage or workshop. With a lifting capacity of 8,000 lbs. (4 tons), you are not going to be limited as to the type and size of vehicle you can lift, which is great if you are working on different types or just want options for the future. The lifting speed is pretty good as well, with it only taking 90 seconds to lift a vehicle from the bottom position to the top, ready for work or storage. A jack tray and set of drip trays are also included with the Auto lift, which means you can jack up your car once it is on the lifting platform and catch any fluids dripping down, which are both nice touches and added extras. Safety is at the heart of the Car-Park-8 and the Auto lift has a great system for locking automatically if there is cable failure called the redundant ladder locking system, and extra large slider blocks that make the whole lift feel much more rigid and stable to work with. These safety features have not been added because of any deficiencies with the build quality, which is excellent by the way, but to give you peace of mind and confidence when you are stood underneath. An example of how well made the Auto lift is, are the cables themselves, they are capable of handling 14,500 lbs. of weight as they are aircraft quality, which is nearly double the 8,000 lb. capacity of the lift. Not bad at all! The Car Park 8 was rated 4 or 5 stars by 100% of reviewers on Amazon and the only downside is the pretty poor instructions, otherwise they would have all been 5 star reviews. Again, pretty decent and one of the reasons why this is on our list. Some comments left included a 1 year after purchase review saying “It works smooth and has made a huge differencein my garage. I would certainly buy it again.”, high praise indeed! Although this car lift is very similar to the NSS-8, in terms of features, it is a little bit larger, so if you need a vehicle lift which is a bit bigger, this might be the one for you, however, is it worth $250 more than the Triumph NSS-8? Not in my opinion it isn’t. Great lift though, on its own merit. 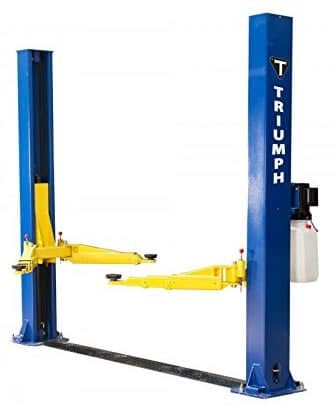 If you don’t quite have the room for a 4 post lift but still want the ability to work under your vehicle comfortably standing up, then a 2 post lift is the way to go and the Triumph NT-9 car lift is an excellent choice. 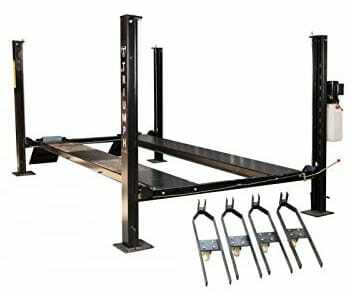 With a lifting capacity of 9,000 lbs., this automobile lift is going to lift any pickup truck, car or SUV that you throw at it and comfortably too. All that for under $2,000! Did you notice that last part? 9,000 lbs lifting capacity for under $2k, are you still here? Hello? Probably gone off to buy one whilst you still can no doubt, but if you are still reading, here are a few more details. Its fast too, with a lifting speed of 40 seconds to raise or lower your vehicle from the top to the bottom, thats less than half the time of the 4 lift posts. The Triumph NT-9 is a well thought out car lift, with a floor plate, that covers the cables so they are not exposed to being run over all the time or a trip hazard. Swing arm handles make it faster and easier to position and 3 stage front arms mean you can reach most spots on a vehicle easily. With buyers comments of “worth the money” and “I think anyone looking a for two post lift would be happy with this one”, this 2 post car lift has gone down very well with buyers, with 85% of buyers on Amazon rating it as 4 or 5 stars. Customer service was praised, which is always good to know and the main negatives seem to stem around the installation instructions with several people noting that they had issues but found great YouTube installation videos which helped them get setup. If you don’t have the room for a 4 post lift in your garage and you want a bit more height to work under, you will find that the Triumph NT-9 is a great option. When you consider the price (cheapest in our review), and the fact that the NT-9 can pretty much lift anything with its 9,000 lbs. capacity, this really is a steal and should be on anyone’s list to consider. A worthy contender that you will not be disappointed with. The second of our 2 post lifts in this review is the BendPak Asymmetric Lift, which can lift up to 10,000 lbs., that is the most of any of the car lifts in this review. Not bad for a 2 post lift! At nearly twice the price of the Triumph NT-9 2-post car lift, what does the BendPak XPR-10A give you extra? For a start, it has a Tru-Metric carriage, which means that you can load your car either from the centerline of the car at the column (symmetrically) or from the centerline of vehicle behind the column (asymmetrically) which basically means that the BendPak XPR-10A is like having two lifts for the price of one. Next up is the 30 degree rotated column feature, which is a first for a 2 post lift and creates added clearance to open the doors when the vehicle is lifted. Great if you need access to the interior of the car. Last up is the padded safety bar which shuts off when your car makes contact, keeping your vehicle safe and giving you peace of mind that you will never lift a taller truck to high and in to the ceiling. Great feature and one I would love to see in more 2 post lifts. Buyers on Amazon said that it is the “best buy in quality and price” and they felt safe whilst working underneath, “rest assured when you are under it”. The only negative comments seem to be from someone who bought the wrong version for their car and someone who is complaining about a different product, not even a car lift! Otherwise the XPR-10A would have got a 100% 5 star rating from buyers. Is this vehicle lift worth the asking price, which is the most expensive in our review? It certainly is a quality product, with great features and a huge lifting capacity, but it is probably priced a little too high for my liking, so personally I would go with the Triumph NT-9 based on price and the BendPak XPR-10A, if I wanted the best 2 post lift. The QuickJack BL-50000 SLX is the second scissor lift in our review and is worth a look for anyone with a lighter vehicle, sports car, track day car or racing team. Because of the QuickJack’s extreme portability, it is just at home in a residential garage as it is in the pit lane at the track. Storing this car lift is also a breeze as you can hang it on the wall or store it in a cupboard for when you need it next, and if you need to take it anywhere, no problem, just throw it in the trailer or back of the truck and off you go. Its fast to use as well. You can have your car lifted in 60 seconds, and that is including positioning under your vehicle, though, it is always to take an extra minute and be safer, rather than sorry! So is the QuickJack a true car lift? Well, it lifts your car, but in reality, it is an infinitely better replacement for floor jacks or 4 jack stands. Much safer to use, far more convenient and it lifts your car higher, 21″ to be precise! One of the benefits of the QuickJack 5000 SLX is its ground clearance, this car lift is perfect for low profile sports and track cars. All you need is 3″ of clearance and you can have your car up in no time! 100% of buyers on Amazon rated this car lift as 5 star. What more can be said? Well they also commented “I don’t know why I waited so long to purchase” and “Awesome product, I couldn’t be any more happier”. Is the QuickJack worth the asking price? It is by far the best option for low profile sports cars and absolutely with out question, the most portable car lift you can buy. However, it is also more expensive than the Triumph 2 post lift, so what do you need, portability or a fixed car lift? That is what would clinch it for me. Whatever you decide, I am sure you will be stoked when you lift your car. 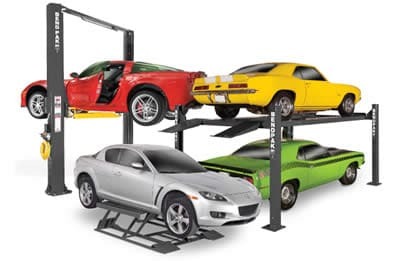 Car lifts come in a variety of options and types, so to help you make an informed purchase we have prepared this buyers guide for the best car lifts for your home garage or workshop. You may be wondering what the purpose of a mid-rise car lift is. A sometimes forgotten option next to 2 post and 4 post lifts, mid-rise car lifts, or scissor lifts, are often chosen for their convenience. The lightweight portability found in these specialty car lifts is one of their top qualities and they can be used indoors or outdoors on virtually any solid surface. Because they can be used on any surface and can be moved according to need, mid-rise car lifts can help increase productivity in shops that require quick maintenance. For car enthusiasts who are looking for a handy lift to use in their home garage, scissor lifts are also great solution. A mid-rise car lift will provide a service bay wherever you need it. The BendPak MD-6XP mid-rise car lift includes special features just to ensure this added convenience. For example, the auto lift includes a heavy duty tow dolly with an electric motor to help with relocation. A single push button unit with a release valve makes lowering vehicles simple and easy. On top of the added convenience, scissor lifts offer an in-between lift level that can be more comfortable. While a short rise car lift may only have three lock positions, a mid-rise car lift will provide more options. 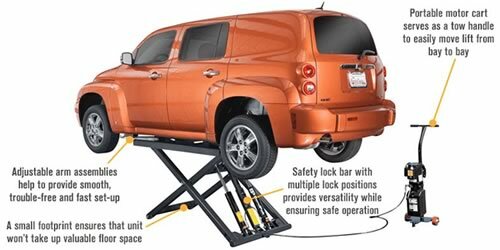 The BendPak MD-6XP mid-rise car lift has several safety lock positions. So, there are more opportunities to find an optimal height that is comfortable for yourself or your technicians. Plus, if you plan on using a vehicle lift in your home garage, these specialty car lifts are a great height for saving space while still fitting indoors. If you have your own personal residential garage or if perhaps you’re operating an enterprise, using a 2 post lift can prove to be an extremely valuable purchase. Providing users with the capability to focus on their automobiles without needing to work with a selection of jacks not only allows you to not waste time but it surely has proven to be a safer strategy to secure a vehicle while it is being worked on. 2 post lifts consist of two large columns which are put on either side of the vehicle. These posts are usually bolted in the concrete floor and depending on model, to the ceiling to avoid any shifting while a car or truck is being raised. On each one of the columns you will find 2 arms that can be released and have the capacity of moving backwards and forwards, and in and out, so they can secure themselves to the resting points of the car or truck. With that said, you might inevitably end up with 4 different lifting points with 2 post lifts. One of the major benefits to utilizing a 2 post lift is it allows the tires to hang down with displacing too much load to the vehicles suspension. 2 post lifts also have the added benefit of not obscuring specific areas of the car or truck providing you the ability to work with every part of the vehicle. When compared to other sorts of lifts, 2 post lifts supply the required lift, with the largest amount of work area available to the mechanic. They will also be much cheaper than the majority of 4 post lifts which is great for those of us on a strict budget. 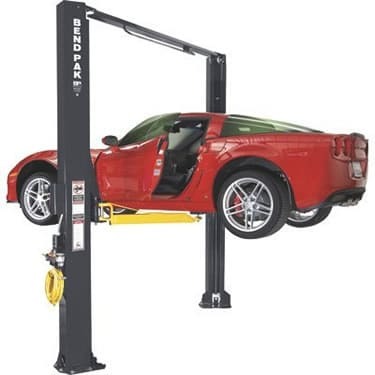 Whether you have your own personal garage or are searching for a means torepair your own personal car or truck at home, buying a 2 post lift may be exponentially better for an individual or commercial enterprise due to its efficiency and benefit. Storage lifts have become very popular for the home hobbyist in the past few years. They are primarily used to store owners classic cars that have limited garage space. These lifts range from many different lifting capacities starting from 7,000 lbs. to 60,000 lbs. Of course the higher capacity lifts are not for the home user, but for commercial use. One such storage lift for the home hobbyist is the Auto Lift Car-Park-8, which is a 8,000 lbs. capacity four-post lift. You will not be limited with the overall usage of this four-post car lift. These storage lifts have different ranges from price to lifting capacity. So making an educated decision depends on your budget, and what you are looking to store on these lifts. For practical reasons, a car enthusiast or homeowner can stay away from the commercial grade lifts, as they are more on the expensive side. 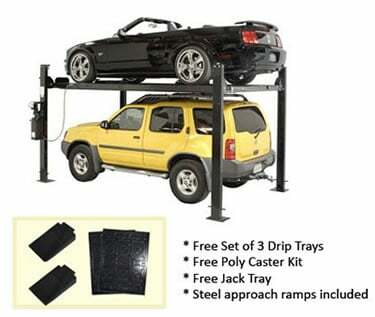 For the home user, these storage lifts comes in many different colors and are ideal for cars and tight spaces. These 4-post storage lifts are built for safety, ease of installation and operation. They can be bolted down or free standing and have formed runways with rail system, single hydraulic cylinder and commercial grade cabling system. The “slack cable” system provides additional security with an internal lock ladder that is adjustable for lift leveling. With the increase of homeowners owning more than one vehicle, and also the increase of classic car restorations, there is an increase in the usage of 4-post car lifts installed residential homes than ever before. Depending on the overall weight of your vehicle, you can choose between many different lifting capacities and if you are looking for quality, safety, and ease of use, the Auto Lift Car-Park-8 and TRIUMPH NSS-8 storage car lifts are ideal for your application.